Murray Masks (Custom Facemasks) ' menu1='Staff' menu1='Certification/Training' var menu2=new Array() menu2='Services' menu2='Facemasks' menu2='How to get a Facemask' //menu2='Upper Extremity Orthotics' //menu2='Lower Extremity Orthotics' //menu2='Spinal Orthotics' //menu2='Other Speciality Orthotics' //menu2='Insurance' var menu3=new Array() //menu3='Hi-Five Newsletter' menu3='Press Releases/News' menu3='Gallery' var menu4=new Array() menu4='Testimonials' menu4='Survey' menu4='Survey Results' //var menu5=new Array() //menu5='Employment Information' //menu5='Employee Application' var menu6=new Array() //menu6='Location' menu6='Contact Us' var menu7=new Array() menu7='Links' //menu7='FAQ' var menuwidth='175px' //default menu width var menubgcolor='#ffffff' //menu bgcolor var disappeardelay=350 //menu disappear speed onMouseout (in miliseconds) var hidemenu_onclick="yes" //hide menu when user clicks within menu? 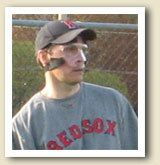 In September 2007, I was badly hurt in a softball game when I was hit between the eyes by a thrown ball as I slid into second base. My face was crushed - shattered septum and frontal sinus, broken nasal bone and two broken orbitals - and I required 11 hours of reconstructive surgery and months of healing. After being physically cleared to resume contact sports with the advice that I protect my reconstructed face, I began to search the marketplace for a protective facemask of some sort. All I found was a cheap looking nose guard with bulky black padding. Knowing that the padding would surely limited my vision, I decided to seek out the makers of a facemask I'd seen worn by the Detroit Piston star Rip Hamilton. The team sent me to Jeremy Murray and Rita at Michigan Hand and Sport Rehabilitation Centers. From the beginning, Jeremy and his staff have been caring, professional and eager to please. They wanted to hear my story and to help me get back to my active lifestyle. The staff provided simple, clear instructions on what they needed from me (a prescription, plaster face casting and front and side photos of my face), and within a week after sending my materials, Jeremy had created and shipped to me a custom made facemask. As a result, I have returned with confidence to competition on the basketball court and on the playing field. The light weight, protective face mask is one-of-a-kind. It's easy to use. It offers superior protection, clear lines of vision and a comfortable fit. After use, it's easy to clean with rubbing alcohol or soap and water. The elastic straps are adjustable and enable me to attach the mask securely but comfortably to my head. In short, there is nothing on the market like it. Without the prompt, professional and courteous service of Jeremy and his staff, I do not believe I would have the confidence needed to resume playing sports. The product is awesome, and the staff is even better. A winning combination. I would highly recommend the facemask and the staff to anyone. They may be one of the best product and service companies I have ever worked with. US Indoor Volleyball team captian and Olympic Gold Medalist, Reid Priddy, recentely travelled to MHSRC to have a custom facemask made. As an outside hitter, he was injured while making a block during training. He is currently playing professionally for Zenit-Kazan in Russia and was in need of a custom mask to allow him to return as soon as possible. Good luck to Reid and the rest of Team USA! !